Australian biographer Rowley (Christina Stead, 1994) offers an insightful look at the African-American cultural icon and iconoclast. Best known for his novel Native Son (1940) and his autobiography Black Boy (1945), Wright was a Mississippi sharecropper’s son, born near Natchez in 1908. His father abandoned the family for another woman, forcing them into extreme poverty, and Richard was placed in an orphanage for a time before being shipped off to Jackson to live with his grandmother (who tried to break him of his writing aspirations and other “soul-defiling habits”). 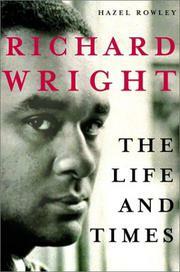 Chicago became Wright’s Promised Land—until he actually moved there when he was 19. Segregation was in full flower at the time, and the young author found he was only welcome in the miserable South Side ghetto. He managed to secure a job with the post office and then worked for the Federal Writers’ Project, first in Chicago and then in New York. He read voraciously and wrote, publishing his first story, “Superstition,” in 1931. Rowley presents him as less single-minded and serious than other accounts, however, drawing on Wright’s packrat trove of first drafts, appointment books, bills, letters, photographs, and newspaper clippings. She posits the reasonable theory that the great attraction communism held for Wright (and for other black authors such as Ralph Ellison and Langston Hughes) was the Party’s acceptance of blacks as intellectual equals. Wright became the Harlem editor of the Daily Worker in 1937, and he married white Party member Ellen Poplar four years later. He eventually broke with the Party over its conformist ideologies and moved with his family to Paris after WWII. There he wrote two more novels, several long political and sociological works, another collection of short stories, a second memoir, and 4,000 haikus before his death in 1960. A fresh and realistic depiction.